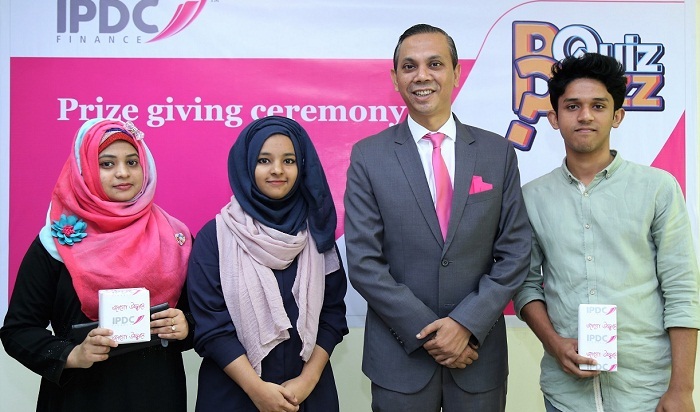 IPDC Finance Limited, the first financial institution of Bangladesh established in 1981, has recently announced the winners of their online quiz competition “QuizBuzz”. IPDC Finance Limited organised an online based quiz competition where a total of 18,410 participants took part in a twenty day long quiz competition where ten general questions were asked. The objective of this competition was to inform people more about Bangladesh and about the activities of IPDC Finance Limited in this country. The winners of the quiz competition were Nadim Hussain, CSE Dept., East West University won an iPhone 7 as 1st prize, Tasneem Jannat Sultan, CSE Dept., East West University won a 43 inch Sony LED TV and Sohana Afroz, Maths Dept., Government Titumir College won an Asus Zen Watch 2 as 3rd prize.